Beef, BBQ sauce, brown sugar, BBQ seasoning, whiskey bourbon, vinegar, honey, liquid smoke, corn syrup solids, cayenne pepper, sodium nitrite. The first flavor I pick up is a sweet BBQ sauce, with touches of spice. The whiskey flavor comes in quick to add its fiery warmth. 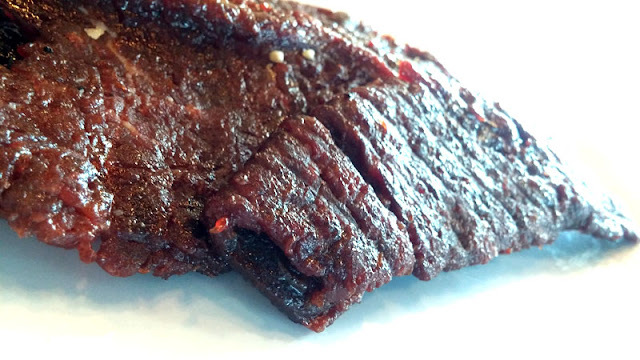 The chewing brings on a decadent BBQ beef flavor, almost like beef ribs. There's a light tanginess going on, and I can pick up a fatty flavor too. For being named, "Whiskey BBQ" it holds up well. I do taste the whiskey component pretty well, mostly as a fiery, alcohol flavor and warmth. Meanwhile, the BBQ part is very well noticed, being sweet and sticky, lightly spicy, comparable to a mild Kansas City style. The level of spice is light enough that I see it as "mild" though it could easily be "mild medium" for others (level 2 out of 5). Otherwise, the primary taste profile is that of a sweet BBQ sauce, spiked with the flavor and warmth of whiskey, with a light spiciness and light salt. 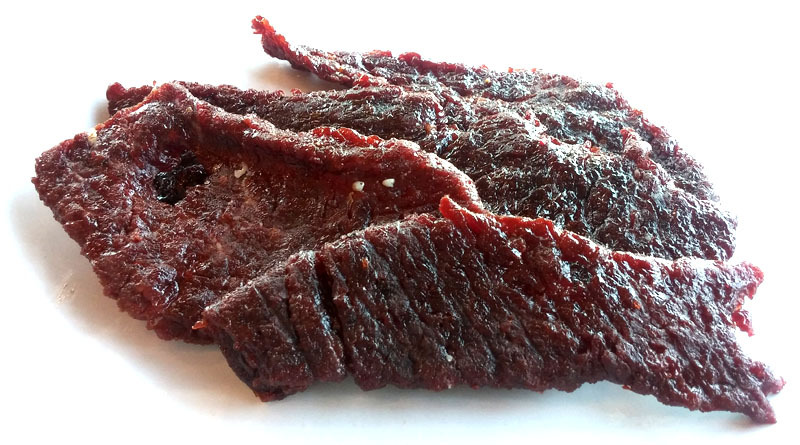 The natural meat flavors are well noticeable, and are supplemented with bursts of fatty character. The meat consistency comes in thick sliced slabs, well marbleized, and quite sticky to handle. They are tender and moist to chew, and once chewed down soft, have a meaty texture, even steak-like, but gummy from the heavy sweet. Some slabs tend to be stringy, others are not. This Whiskey BBQ from Jerky Jerks does a great job of delivering a flavor much like BBQ beef ribs smoked with a sweet Kansas City style sauce. I love the natural meat flavors that come out, and I love the marbleized, fatty character. But it also does well in delivering the taste of whiskey unlike many other brands. 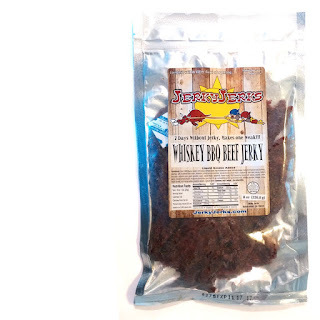 I have the larger, 8oz package which perhaps offers thicker, meatier slabs that punch out more flavor. So if you want the full goodness of Whiskey BBQ, definitely go all in. Your two guys that are in Sparks for the rib cook off are Really Jerks!!! Moving residence garbage cans and threatening and harassing senior citizens is against the law if they had gotten their lazy asses up and to work earlier and parked where they were supposed to they wouldn’t have to park in the residential areas. We were told to put our cans out so we could park went we got home. I have lived in California near you most of my life and have Never seen jerks like this!! !